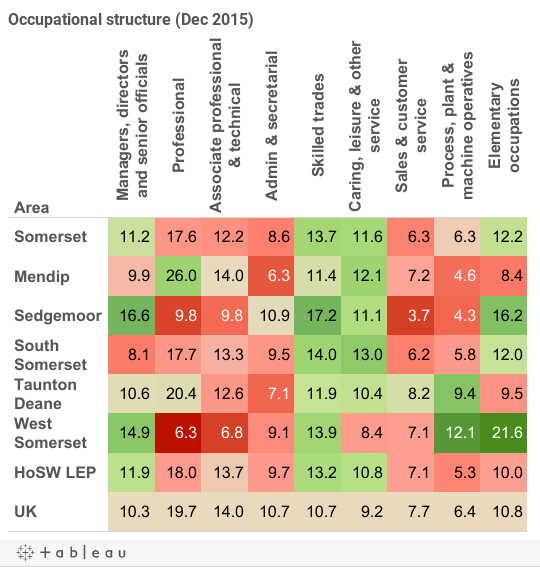 The largest occupation group in Somerset are professional roles (17.6%), compared to 19.7% at a national level. Skilled trades are well represented in all Somerset districts compared to the UK as a whole. Sedgemoor had the highest proportion employed within Managers, directors and senior official sector with 16.6%. Source: Annual Population Survey, NOMIS 2016. Graph uses annual data. Source: Annual Population Survey, NOMIS 2016. *Estimate and confidence interval unreliable since the group sample size is small. 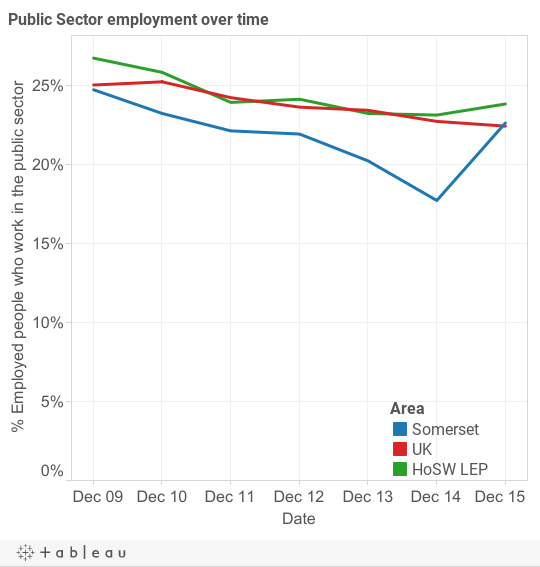 Somerset has a smaller proportion of people employed in the public sector than the UK and Heart of the South West area; 24.7% compared to 25% and 26.7% respectively. 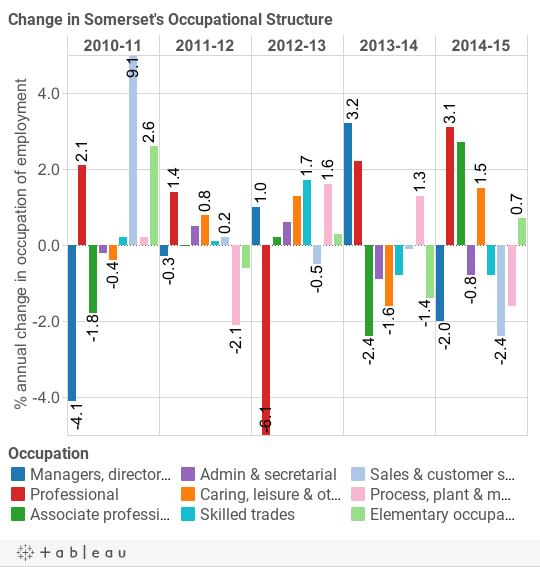 Public sector employment in Somerset peaked at 24.7% of the workforce in (Jan – Dec) 2009. Since then, the number of people employed in the public sector in the County has decreased, but saw a small increase in September 2015. Source: Annual Survey of Hours and Earnings (ASHE), NOMIS 2015 (updated annually). Figures are not available for Sedgemoor (2014) due to statistical unreliability. ASHE data is not produced for LEP areas. Average earnings in Somerset consistently lag behind the UK level. However, West Somerset has the highest median earnings in the County (£30,465), this is higher than the median annual earnings for UK (£27,645). 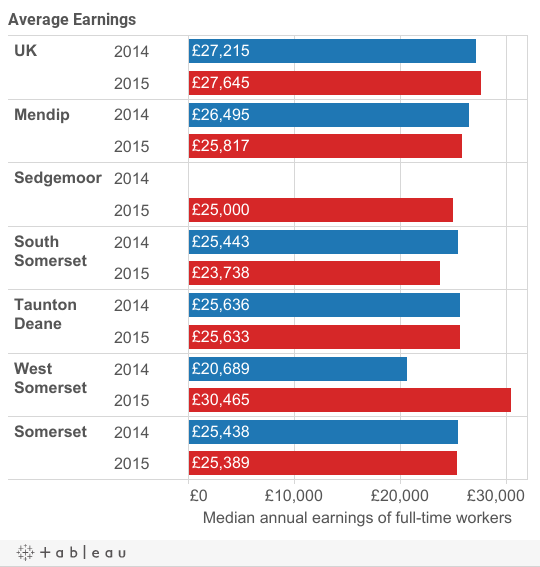 South Somerset has the lowest (£23,738) median earnings.